Porth Nobla Beach01286 672232work BeachPorth Nobla beach is a rural sandy beach with cliffs to one side and rock pools; it is located between the villages of Rhosneigr and Aberffraw and south of Llanfaelog. A perfect location for watersports such as canoeing, fishing, sailing, swimming and scuba diving. Toilets 0.5 mile; other facilities in Rhosneigr or Llanfaelog. Limited parking. Dogs are allowed. 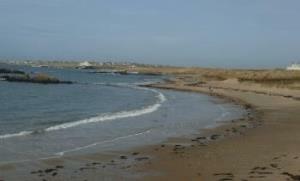 Porth Nobla beach is a rural sandy beach with cliffs to one side and rock pools; it is located between the villages of Rhosneigr and Aberffraw and south of Llanfaelog. A perfect location for watersports such as canoeing, fishing, sailing, swimming and scuba diving. A55 Junction 5 & A4050 signed for Rhosneigr. Continue on this road through Llanfaelog and the small parking area for Porth Nobla will be on the right.